What would you like as your epitaph? Have you ever thought about what words you would like to have inscribed on your tombstone? It may sound kind of morbid to speak about epitaphs on Easter Sunday but, in light of Jesus’ resurrection on the third day, it’s not morbid but a message of hope. Why, because death is not the end! You and I have hope! Because of the events of that first resurrection Sunday, we can be assured that we too will be raised up. It is as St. Paul wrote to the Corinthians: “Christ the firstfruits; afterward they that are Christ’s at his coming” (1 Cor. 15:23). Or consider Peter’s words: “Blessed be the God and Father of our Lord Jesus Christ, who according to His abundant mercy has begotten us again to a living hope through the resurrection of Jesus Christ from the dead, to an inheritance incorruptible and undefiled and that does not fade away, reserved in heaven for you, who are kept by the power of God through faith for salvation ready to be revealed in the last time” (1 Pet. 1:3-5). Because Jesus did not stay in the tomb, because He rose from the dead on the third day, after suffering and dying on the cross to pay the just punishment for the sins of the world, because the tomb was empty when the women arrived to anoint the body of Jesus, because He appeared to the women, to Peter, to two on the road to Emmaus, to the eleven in the upper room and even to more than 500 people at one time – most of whom were still alive at the time of Paul’s writing (cf. 1 Cor. 15; Mark 16) – we have hope and the certainty of our resurrection on the Last Day. Jesus said, “Because I live, you will live also” (John 14:19). Those words would mean little if Jesus did not rise from the dead. If Jesus did not rise bodily from the grave on the third day, we would still be dead in our sins and without hope (cf. 1 Cor. 15:17ff.). “But now Christ is risen from the dead, and has become the firstfruits of those who have fallen asleep” (1 Cor. 15:20). Jesus was “delivered up because of our offenses, and was raised because of our justification” (Rom. 4:25). He paid in full for our sins and was raised up, showing that we are indeed justified and forgiven through faith in Him and that we too will be raised up on the Last Day when Christ Jesus returns! Therefore, we can say with Job: “I know that my Redeemer lives, and He shall stand at last on the earth; and after my skin is destroyed, this I know, that in my flesh I shall see God, whom I shall see for myself, and my eyes shall behold, and not another.” Though we die and decay in the grave, our risen Savior will raise up our bodies and we will see Him who died for our sins and rose again to give us life everlasting! Cf. 1 Thess. 4:13ff. ; Psalm 16:11. O my risen Savior, grant that I live and die in the confidence which Your resurrection gives, and raise me up on the Last Day to the eternal joys of Your kingdom. Amen. 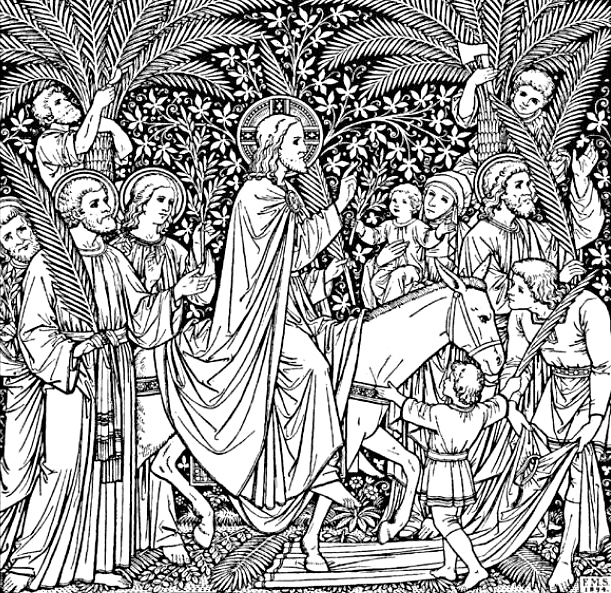 Do you know what Palm Sunday and the events of that day are all about? Yes, you may know what happened on that day – how Jesus rode into Jerusalem on a donkey’s colt and was hailed King of the Jews, but why? What does it all mean? What was written about Jesus? From the Book of Zechariah, we see the ancient prophecy: “Rejoice greatly, O daughter of Zion! Shout, O daughter of Jerusalem! Behold, your King is coming to you; He is just and having salvation, lowly and riding on a donkey, a colt, the foal of a donkey” (Zech. 9:9). We see these very words fulfilled; the people shouted words of praise to Jesus as the Messiah and Savior of Israel. They hailed Him as their King. And, Jesus was riding upon a donkey’s colt, just as the prophecy said and similar to the way King Solomon was made known as the king of Israel (cf. 1 Kings 1:32ff.). And what did they cry out? John tells us the multitude cried out: “Hosanna! ‘Blessed is He who comes in the name of the Lord!’ The King of Israel!” In Matthew 21:9, we read: “Then the multitudes who went before and those who followed cried out, saying: “Hosanna to the Son of David! ‘Blessed is He who comes in the name of the Lord!’ Hosanna in the highest!” Compare that to the words of Psalm 118:19ff. Hosanna, which is a call to the LORD to save now, together with the references to Son of David, King of Israel and He who comes in the name of the LORD is an acclamation of Jesus as the Messiah and promised Savior who would save His people and establish an everlasting kingdom (cf. 2 Sam. 7:16). Thus, the events of Palm Sunday were a declaration that Jesus is the long-promised Messiah, the Son of David and King of Israel who would save His people and establish an everlasting kingdom. The people were calling upon Him to save them as God had promised. He was the one who would “redeem Israel From all his iniquities” (Psalm 130:8). And, this, just days before He was crucified and died for the sins of the world to provide that promised salvation! And we too cry out: “Hosanna! ‘Blessed is He who comes in the name of the Lord!’ The King of Israel!” We pray that He would usher in the day of our salvation – the salvation he won for us upon Calvary’s cross. We long for Him to come again and enter into the gates of the New Jerusalem and establish His everlasting kingdom and be our God and King forevermore! Cf. Phil. 2:5ff. ; Rev. 7:9ff. ; 19:11ff. ; 21:1ff. ; 21:22ff. Hosanna, Hosanna, Hosanna in the Highest! Blessed is He who comes in the name of the Lord! We praise You, Christ Jesus our Savior, and pray that You would come and establish Your everlasting kingdom and reign over us as our God and King. Amen. What a terrible thing to die in your sins — to die and stand before the holy Judge of all still bearing the uncleanness and guilt of your sins! Yet, this is what was soon to happen to a great many of the Jews in Jesus’ day. Jesus warned them, “I am going away, and you will seek Me, and will die in your sin. Where I go you cannot come” (John 8:21). Because so many of His Jewish hearers saw no need to repent of their sins and trust in Jesus as their Messiah and Savior, they would die in their sins and face the eternal wrath and condemnation of God. Where Jesus was going — to the right hand of God the Father in heaven (cf. John 14:1ff. ; Eph. 2:20f.) — they would not be able to come! Instead, they faced a Christless eternity and the everlasting torments of hell! Again, Jesus warned them, “Therefore I said to you that you will die in your sins; for if you do not believe that I am He, you will die in your sins” (John 8:24). Jesus’ words still ring out today! Many are headed to an eternity of everlasting punishment for their sins. Unless people repent and turn to God’s Son, Jesus Christ, who was lifted up on the cross to suffer and die there for us and bear the full punishment for our sins and the sins of the whole world, they will die in their sins and face the holy God in their own uncleanness and guilt! What about you? Will you die in the guilt of your sins and face the eternal wrath of an angry God? Or, will you, by the grace of God, turn to Jesus and receive His full and complete forgiveness for your sins and enjoy the everlasting blessings of life in heaven with Him? The Bible tells us: “And as it is appointed for men to die once, but after this the judgment, so Christ was offered once to bear the sins of many. To those who eagerly wait for Him He will appear a second time, apart from sin, for salvation” (Hebrews 9:27-28). Jesus has already died and paid in full for your sins. His resurrection on the third day is proof that God accepted His death as full payment for the sins of the world (cf. 1 Cor. 15:3,4; Rom. 4:23-25)! Why die in your sins and be condemned of God? Turn in faith to Jesus and His shed blood and be forgiven and saved (Cf. 2 Cor. 5:19-6:2)! O dearest Jesus, have mercy upon our wayward hearts and draw us to You that we might not enter into eternity bearing the guilt and condemnation for our sins, but have, instead, the assurance of forgiveness and life everlasting for the sake of Your holy and precious blood, shed for us upon the cross. Amen. How can you be righteousness under the Law? Some in Jesus’ day misunderstood and thought that Jesus was trying to throw out all that is taught in the Old Testament Scriptures because He offered forgiveness and life through faith in His name. Unfortunately, some today assume that Jesus’ teaching does away with the Old Testament and makes these Scriptures obsolete and unnecessary for Christians. Many even believe and teach that one can be a Christian and disregard some or all of what the Bible teaches. This couldn’t be further from the truth! It is as Jesus said: “Do not think that I came to destroy the Law or the Prophets. I did not come to destroy but to fulfill. For assuredly, I say to you, till heaven and earth pass away, one jot or one tittle will by no means pass from the law till all is fulfilled.” Jesus, the long-promised Messiah and Savior, came to fulfill all that is taught in the Old Testament, not to destroy it. Not the smallest letter (jot) of the Law or the smallest part of a letter (tittle) in the Scriptures will pass away until all is fulfilled. Thus, it is a grave offense to break even the smallest commandment in the Scriptures and teach others so. Those who do so will be excluded from God’s kingdom. And, as a study of the Scriptures will reveal, the righteousness which God demands is far greater than the outward righteousness of the scribes and Pharisees. It far exceeds the righteousness of the churchgoers of our day who depend on their own righteous works and deeds. The Scriptures demand perfect righteousness of heart, soul and mind (cf. Lev. 19:2; Matt. 5:48). The Scriptures demand a holy life in thought, word and deed — righteousness which we do not have and cannot attain by our own attempts to keep God’s Law (cf. Rom. 3:19-20). But Jesus came to keep every commandment of the Scriptures perfectly for us. 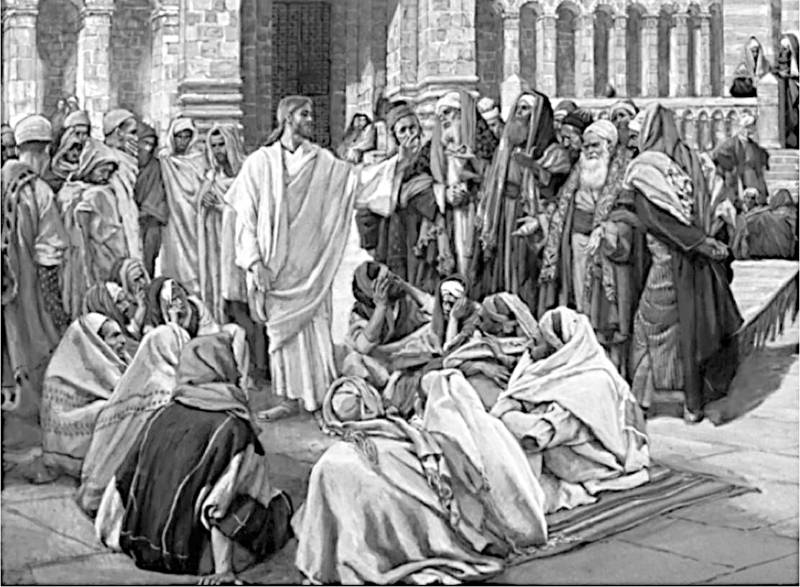 He regarded the Scriptures as the very Word of God and was obedient to every teaching of the Law and the Prophets! He fulfilled all and regarded all as absolute truth. He fulfilled the righteous demands of the Scriptures for us. Jesus also, as prophesied by the Law and the Prophets (the Old Testament Scriptures), took our place under God’s Law and took the guilt and punishment of our sins upon Himself, that we might have forgiveness and life through faith in Him and His blood shed for us upon the cross (cf. Isa. 53:6). And these same Scriptures declare to us Christ’s full atonement for our sins and the acceptance and pardon of a merciful God for Jesus’ sake (Cf. 2 Cor. 5:18-21; Rom. 3:21-28; 4:3-8; 5:18ff.)! They offer to us the imputed, perfect righteousness of Christ Jesus that we might stand in God’s judgment through faith in Jesus’ name. Dear LORD Jesus, holy Son of God and true man, our Savior, thank You for fulfilling for us the perfect righteousness taught and demanded in the Holy Scriptures, and thank You for bearing upon the cross the full and just punishment for all our sins and then rising again to grant us forgiveness and life — perfect righteousness — through faith in Your name. Amen.